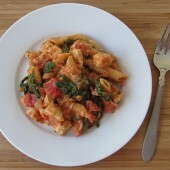 Instead of slow cooker Sunday this past weekend, I opted for whipping up a new and very easy pasta dish. It’s definitely great for any day but especially perfect for a cold winter day. 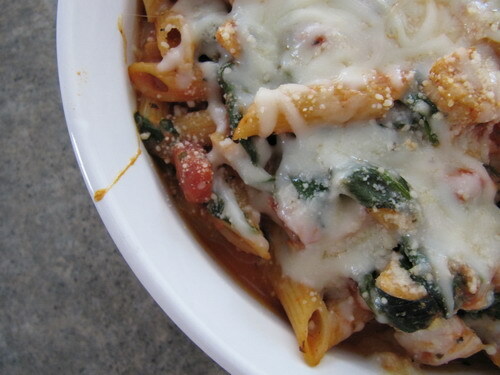 Aren’t most comfort foods even better in the winter? Who wants to be hovering over a stove when it’s 80+ degrees outside. Since our high temps have been in the 20’s as of late, I figured what better time to try this recipe. The original recipe seemed okay but I like to alter almost all recipes more to my liking and I suggest you do that as well, whether for this dish or any dish you’re cooking. There is always room to play with a recipe, change the spices, change the amounts, add new things in. I fully believe in playing with recipes and making them your own, most of the time anyway. I’m definitely pleased with my altered version. It has a sutble heat and tons of flavor, which is thanks to some new spices and add-ins such as garlic and red pepper flakes. If I had remembered I had mushrooms on hand, I would have tossed those in too. This dish could very easily be made vegetarian by omitting the chicken or simply switching it up and using tofu or a faux chicken ‘meat’ instead. Preheat oven to 375. Cook pasta in a large saucepan according to package directions, omitting salt. When 1 1/2-2 minutes remain, add spinach. 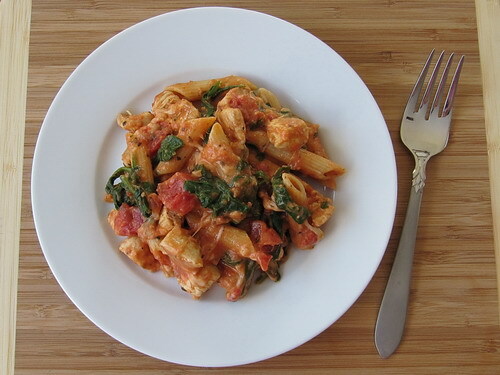 Gently push spinach into water and pasta until all spinach is covered. Drain well. Set aside. In a large fry pan, heat 1-2 tbsp olive oil. Begin cooking chicken. When chicken is half cooked, add seasonings: pepper, optional red pepper flakes, garlic, basil and thyme. Continue cooking until chicken is fully cooked. Add tomato sauce and diced tomatoes. Bring to a boil, then reduce heat and simmer for 3 minutes. Stir in cream cheese cubes. Transfer chicken and sauce mixture to a large bowl. 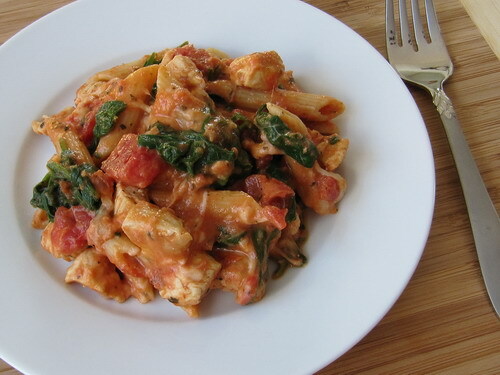 Then combine pasta and spinach with the chicken mixture. Mix well. Spoon a third of the mixture into a large baking dish, at least 2qts - slightly larger is even better. Sprinkle with a portion of the mozzarella. Repeat layers two more times, finally topping off with remaining mozzarella and sprinkling with parmesan. Bake covered with foil for 20 minutes and an additional 3 minutes uncovered. Serve warm.